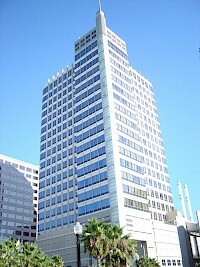 The Bank of the West Tower, also known as 500 Capitol Mall, is a 25-story 433,508-square-foot (40,274.2 m) high-rise in downtown Sacramento, California with a 10-level, 800 stall parking garage. The building consists of a 5-story atrium/lobby, ground floor retail, office space, and a 2-level penthouse restaurant or meeting facility. The structure has a steel frame and features a granite curtain wall with stone-on-precast and stone-on-truss panels on the exterior. The Capitol Grand Tower is a proposed residential skyscraper located on the northeast corner of 12th and J Streets in downtown Sacramento, California. 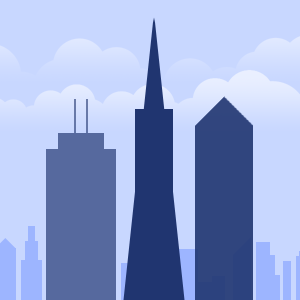 The proposal stands at 965 feet (294 m), which is significantly taller than Sacramento's current tallest building, the Wells Fargo Center. The tower was originally proposed as a 701 foot (213 m) tower containing 56 floors. These floors would contain 280 condominiums, 200 hotel rooms, and 50,000 square feet (4,650 square meter) of office space. Esquire Tower, also known as Esquire Plaza, is a 322 foot (98 m) 248,816 square foot office building in downtown Sacramento, California. The Esquire IMAX Theater as well as a restaurant are located on the ground level of Esquire Plaza. The Renaissance Tower is a 372ft (113m) skyscraper in Sacramento, California. It was completed in 1989, and has 28 floors. When it was built it was the tallest building in Sacramento, and is now the 5th. Locals also call this building the "Darth Vader" building due to its dark ominous appearance. The Towers on Capitol Mall were two 53-story, 615 foot (187 m) mixed-use towers to be built in downtown Sacramento, California. The buildings (The Towers on Capitol Mall I & II) were planned to have 804 condominiums, a 200 room InterContinental Hotel, and ground floor retail. Rumoured retailers include Gucci, Prada, Kenneth Cole and Tiffany & Co.. This article is about the building in Sacramento. For the skyscraper in Los Angeles, see U.S. Bank Tower (Los Angeles) The U.S. Bank Tower (also called 621 Capitol Mall) is a 25 story, 402 foot (123 m) tall building in Sacramento, California. 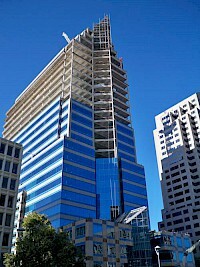 The office tower is located at 621 Capitol Mall and was completed in early 2008. U.S. Bank bought the naming rights and 34,000 square feet (3,100 square meters) of office space. The building's architect is Hellmuth, Obata + Kassabaum, Inc.
Wells Fargo Center is a 129 m (423 ft) office building in downtown Sacramento California. 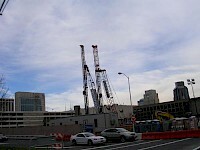 Construction on the skyscraper began in 1990 with completion in in 1992, and yet stands as the tallest building in the city. The building occupies a 2.3 acre city block, and features a five-story granite and marble walled interior within a clear glass atrium. The project was developed by Hellmuth, Obata and Kassabaum.